1. 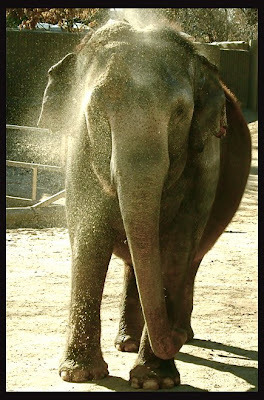 I have a memory like an elephant (I took this picture at the Denver Zoo on Friday). My friends and family cannot believe how I can retain random information for decades! 3. My watches have always been chunky. I can't see myself with a dainty one. Right now I wear this one - I bought it for the pink acrylic strap. It is by Fossil. 7. My sense of humor can be wicked too. I love playing practical jokes on my friends and family. Silly little unsuspecting things in conversations are some of the funniest moments for me. Oh my GOODNESS, I seriously think we are identical twins!!!! I see myself in every SINGLE thing you mentioned, LOL, I'm not kidding!! It was so fun to learn more about you, and to learn that we're basically just alike!! So much fun to learn more about you, Kazan! Cute pics Kazan! Oh yes I can personally attest to your practical jokes, it does not help that I am super gullible either:) Cute post! Want to know what my favorite dessert is? CHOCOLATE MOLTEN CAKE!!! They make one at Chili's and it's OH so good. But I bet yours is 100x better. I might have to come and visit you and Laura now just to have some chocolate molten. MMMM. I have to say that I'm not surprised that your clothes are organized. You seem like a very organized person. I'm totally 1,4,5 and 6 and mostly #2! Too funny! Great getting to know you better! It's so fun to get to know little facts about you! 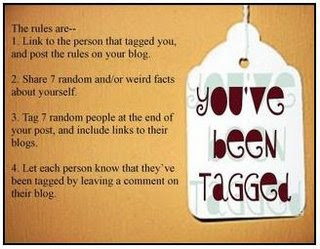 These tags can be fun, that's for sure. And oh, I sure would love your recipe for the chocolate molten cake....sounds yumm!!! So fun, Kazan! I also love to bake and can be competitive, but that's about it! Other than that, we are opposites ;) I love the appearance of organization, but it doesn't come naturally (I wish). I love to wear skirts/dresses, I have a complete sweet tooth, and my watch is pretty small :) Oh, and most important...I have a terrible memory!! LOL! That is GREAT Kazan!!! I love learning more about my bloggy buddies!!! I love the pictures to go along with your facts.....FUN!! HUGS!!! Toot from a snowy Denver!